As an artist, you want to be sure that your work is sellling. Sure you could stock pile it and hang on to it, but that would mean you would have to take a day job, making money somewhere else to support your work. 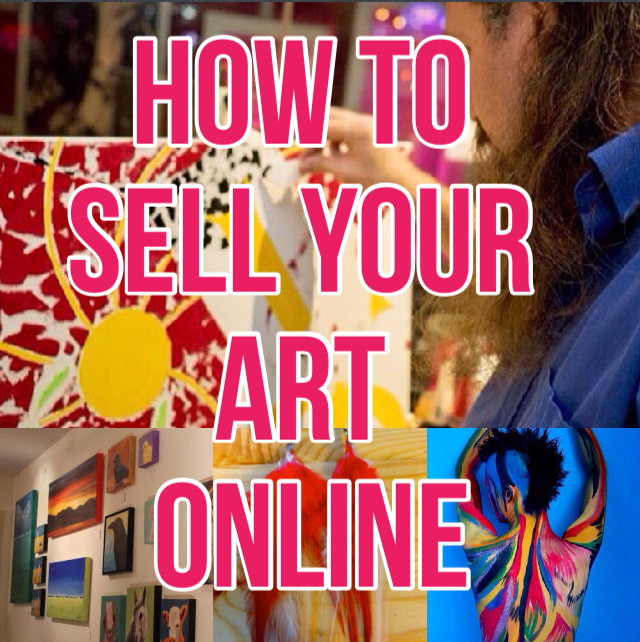 If you are a full time artist, you will understand that the necessity to sell your art is likely the most important process of being a full time artist today. Some of you might be emerging or even established and you’re wondering how to possibly sell more art without booking so many shows, events and working directly with clients. Have you tried selling your work online yet? Here is our three step process to listing and selling online! YES! How can people buy something from your site; without visiting you at a show, event or coming to your studio, if you don’t have anything to sell online? Sounds pretty simple and it is! No matter what website platform you are working with, many of them will have an option to either create an online store or to add in PayPal links to work that you want to sell. Check out our sister brand MAB Art Studio & Boutique Gallery’s store HERE This site store is built on Yola, a simple but effective way to list multiple products. Another way to do it is simply open up a PayPal account and link html codes to images that you want to sell. Now that you have your store set up, you need to get people to go there to check out your work and buy it. HOW? Well, be sure to PROMOTE your online store. No one else but you is going to do this, especially in the beginning. Use every kind of resource that you can think of; Facebook, Instagram, Twitter, LinkedIn, and of course, list in your community’s sites like Craigslist, Kijiji, or even on community boards with old school flyers! Yes, old school still works too! One of the most effective ways to build a brand and awareness of it is to run a great contest or promotion. What can you offer without feeling like you are selling your soul? Be fair to yourself and to your market, but also be sure that you are offering something people will actually want! (Don’t be re-gifting that old pair of mittens you got at Christmas from Auntie Jean last year as a contest giveaway!) Think about things that you would actually want. A $5 Starbuck’s card with every purchase of a necklace of over $50. A free movie ticket when you buy an art class or even a free art card with the purchase of any of your paintings. The possibilities are endless here! You will not only help sell your product by increasing excitement about it, but you will also reward your customers…everyone loves rewards! If you have a comment about this tip, be sure leave it below. We also love when you share our tips with your artsy friends. Help another artist out by sharing this post. Come on, you know you wanna!